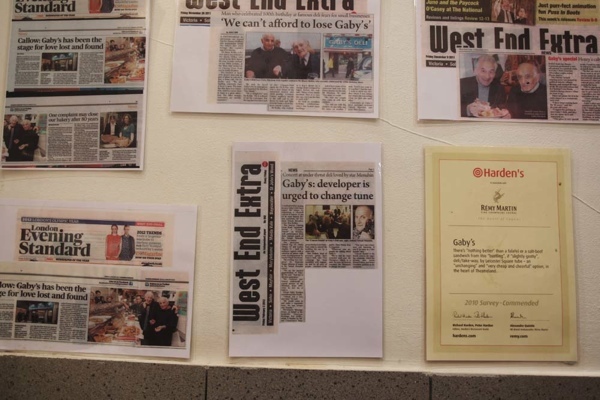 It is my pleasure to welcome this report from the West End by Jenny Linford accompanied with photographs by Simon Mooney. 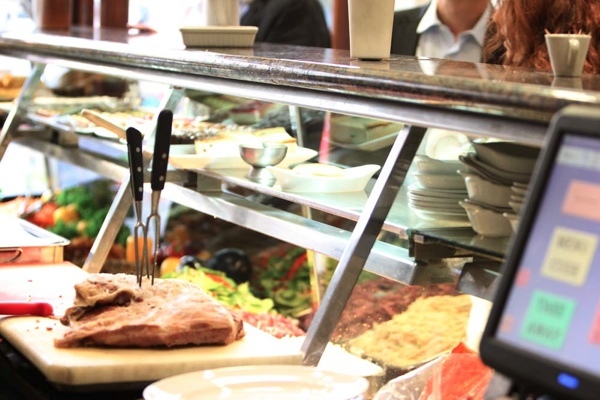 The only independent cafe around Leicester Sq, Gaby’s Deli is a London institution where you can dine for as little as five pounds and discover yourself rubbing shoulders with West End stars too. After a threat of closure by the landlord, a popular campaign won a reprieve but now Gaby is on a monthly lease which offers no security. 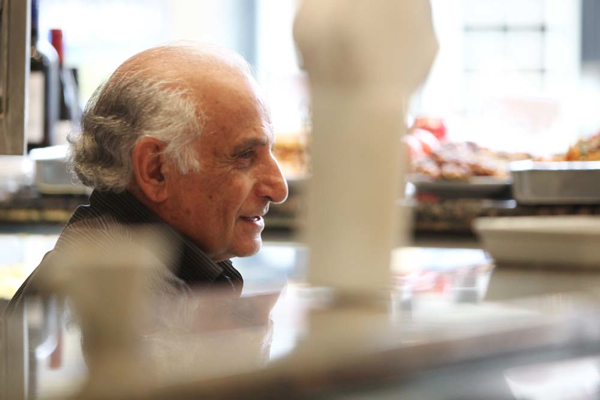 So we thought it an opportune moment to celebrate the wonders of this cherished cafe and Gaby Elyahou himself, the man who brought falafels to London. 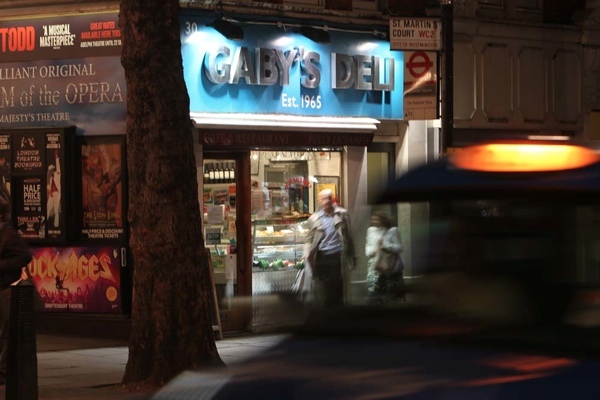 For as long as I can remember, Gaby’s Deli on Charing Cross Rd has been part of my London cityscape. 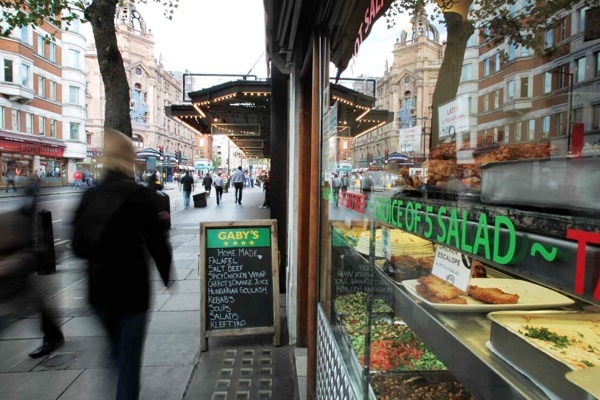 Just down from the Wyndham Theatre, it is a familiar West End presence – a modest façade with Gaby’s trademark colourful salads proudly displayed in the window. 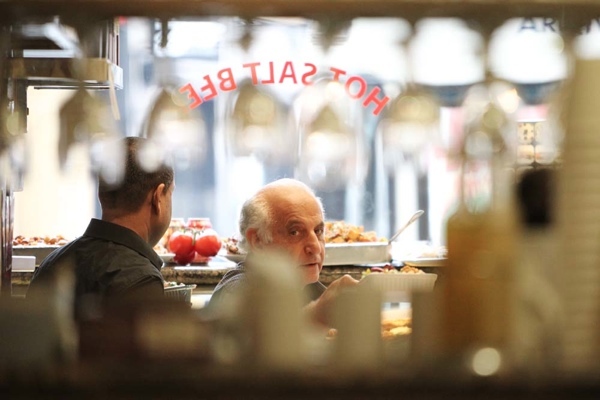 Since last year, this modest, down-to-earth eaterie has been under threat, with Gaby given notice to quit by his landlords, Gascoyne Holdings. 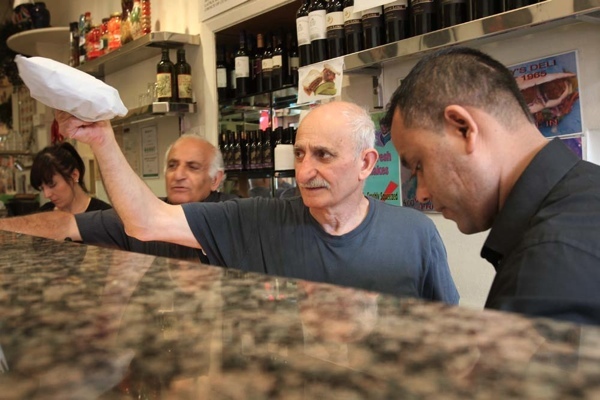 As we chat, Gaby insists on ordering me a plate of his falafel to sample. 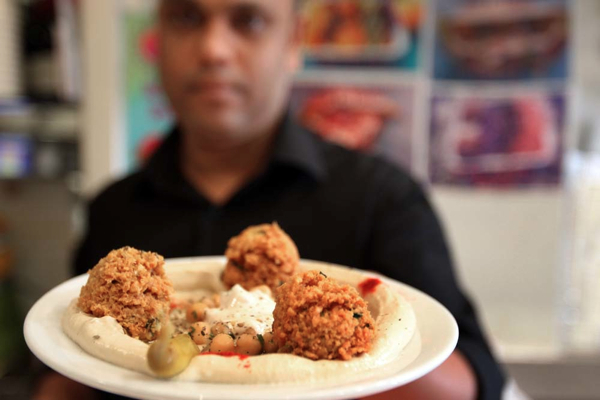 It arrives promptly – a generous serving of crisp, freshly-fried falafel on a bed of humous, topped with foul medames, then tahini, sprinkled with parsley, with two warm pitta bread on the side. 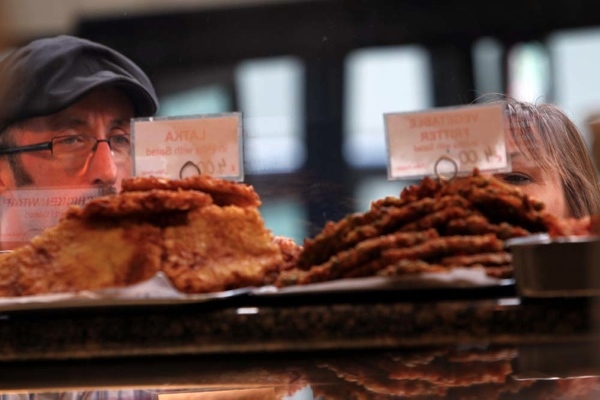 Truly tasty food. Watching Gaby in action, teasing the old ladies sitting to our left, calling out a friendly greeting to a customer walking by, noticing that a customer needs sugar for his coffee, I realise, however, it is not simply the good, fresh food and the reasonable prices which bring people back here time and time again. This is a place with a human face to it. 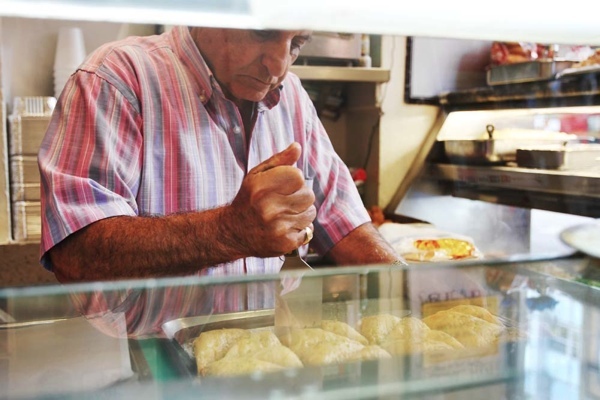 Gaby is one of a fast-vanishing breed of proper, old school proprietors – alert, democratic, experienced, proud of his business, relishing the face-to-face contact with all his customers, gloriously nosy and interested in everyone who comes in. 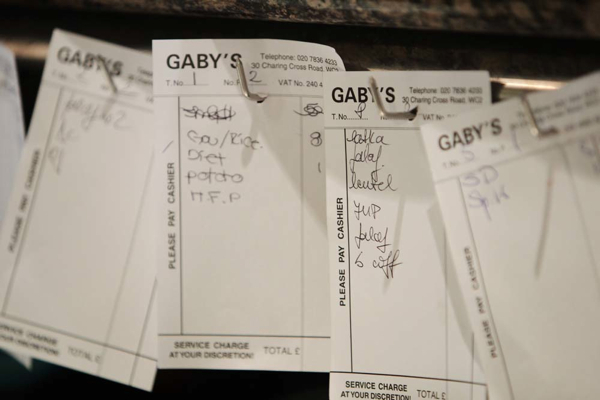 As a result, in a world where clonetown franchises dominate, Gaby’s has that rare quality – personality. 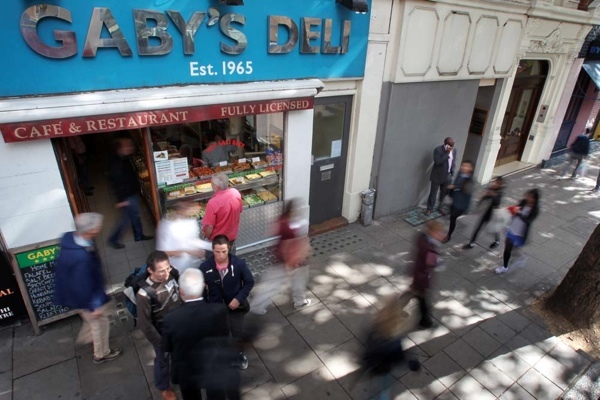 The announcement that Gaby’s was being closed down saw an extraordinary response from his customers, with their Campaign to Save Gaby’s launched on Facebook quickly attracting thousands of supporters. 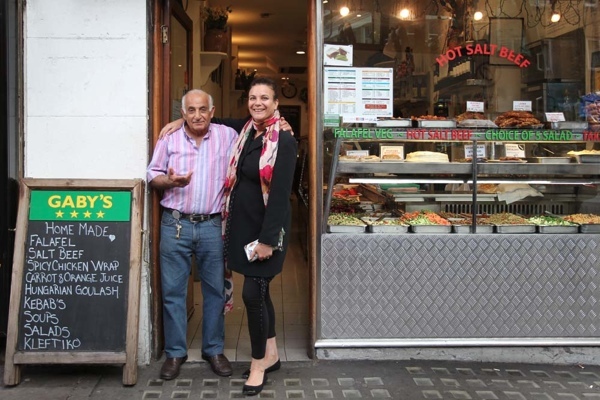 A series of Falafel Cabarets were launched, with Gaby’s thespian customers, such as the actors Henry Goodman and Simon Callow, generously performing to help spread the word. 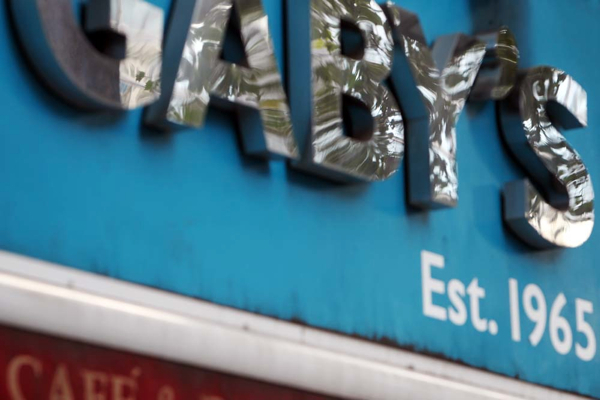 “The only hope,” explains Steve Engelhard from the Save Gaby’s campaign, “is to change the mind of Gascoyne Holdings and its directors, notably Lord Salisbury – because everything else has been tried. Westminster have granted the planning consent. The only remaining hope is to change the minds of the owners. We’ve had huge press coverage. The question is do these people want to minimise the bad publicity they’re getting? 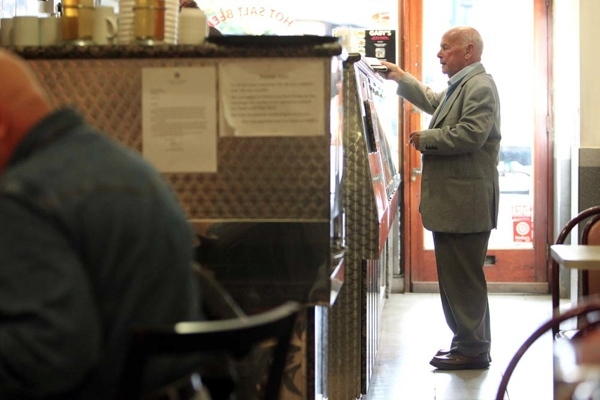 Do they want to be clever and get good publicity for doing the right thing in the end and saving a well-loved institution?” If affection and loyalty alone were enough to save Gaby’s deli, then its future would absolutely be assured. 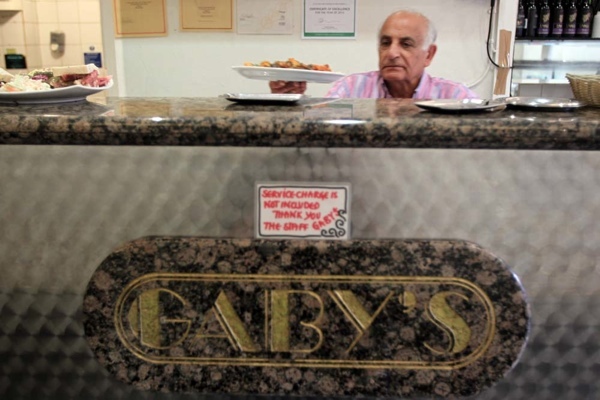 What fabulous photos – they so capture the spirit of Gaby’s and make me pine for falafel! 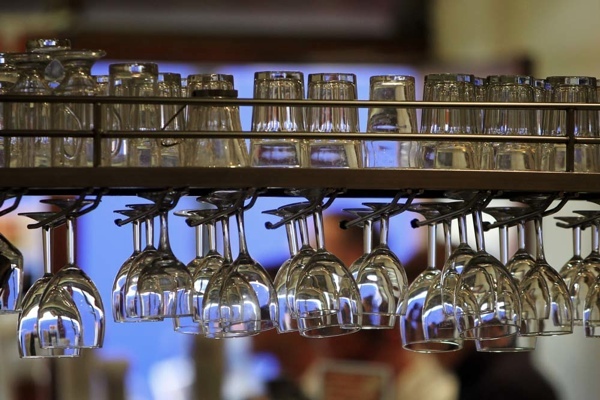 We hope Gaby’s is safe for a while yet but will let you know if the threat re-appears. This is dreadful. I’m straight on to Facebook and a letter to his Lordship will be in the post this morning. Perhaps Viscountess Boudica could put in a word. What a wonderful article and such lovely photos as well, they capture the essence of Gaby’s perfectly. 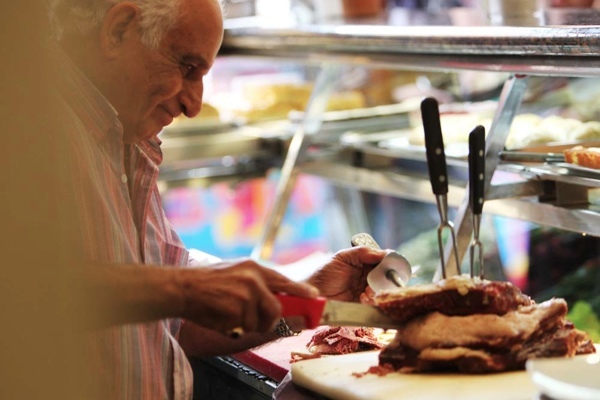 I only discoverd Gaby’s about six years ago, and love this deli. Hope it remains for years to come. 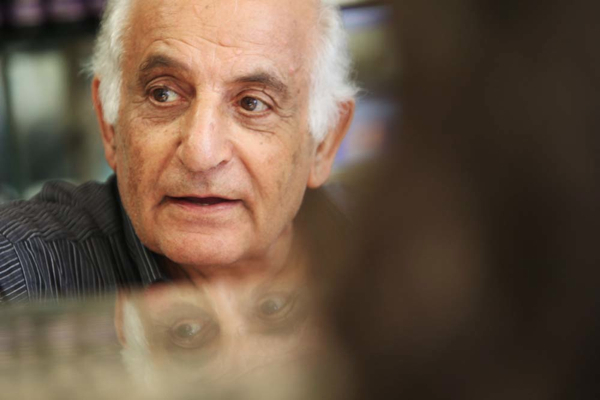 Really great photos – stumbed across them accidentally, and must visit again soon.